Uri Zvi displays vandalized poster ripped off a pro-Israel display this past Friday. 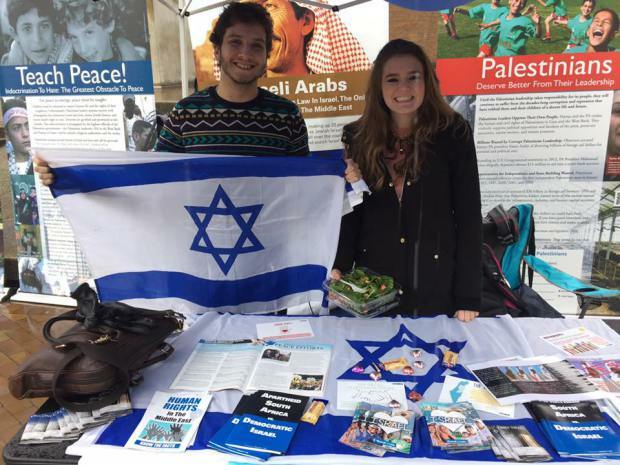 Undergraduate Adam Rozen-Wheeler along with several other students were looking forward to setting up their Israel educational display on the University of Washington’s Red Square this past Tuesday afternoon for a week of Israel advocacy on campus. 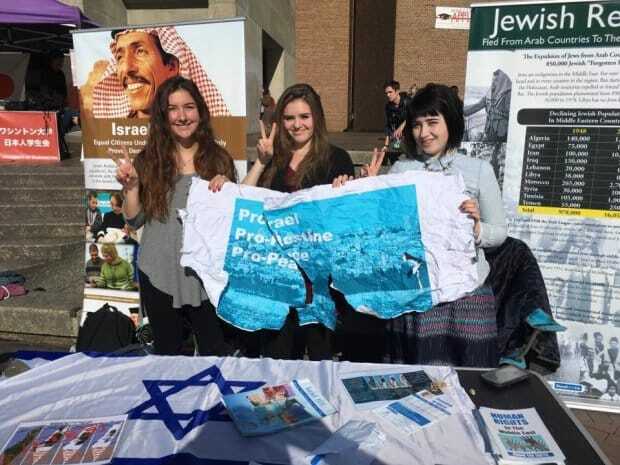 When the students, all affiliated with the Coalition of Husky Allies for Israel (CHAI-UW) set up their table piled high with posters, brochures, Israeli chocolates and pro-Israel swag, they were expecting to engage in robust discussions regarding Israel and the Middle East. Instead, anti-Israel students, believed to be affiliated with anti-Israel organization SUPER-UW tried to shut them down. “It was sort of a microcosm of the Arab-Israeli conflict” Rozen-Wheeler told me. “After we set up, an anti-Israel student told the UW Office of Student Activities that we were too close to SUPER-UW’s display”. Rozen-Wheeler was struck by the absurdity of the demand considering that SUPER-UW set up on Red Square well after CHAI-UW and deliberately chose to assemble their anti-Israel display near the pro-Israel table. 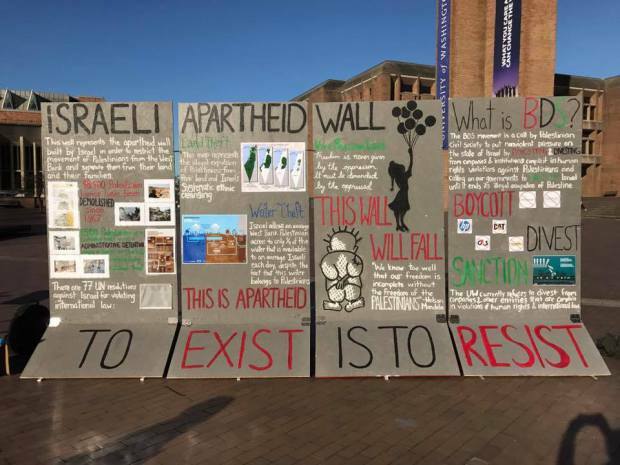 Anti-Israel students set up their “borderline anti-Semitic” wall (above) near the pro-Israel display, and then complained to university authorities that the Israel display was too close. “Unfortunately” noted Zvi “the other group didn’t feel the same. After setting up unreasonably close to us, they complained to the university that our display is offensive and “triggers” them”. Noted Zvi, “our display was all about peace and coexistence, that the anti-Israel group found it offensive is a real self-indictment against them”. Soon after, a representative of the UW Student Activities Office arrived and told the Jewish students to pack up and move. They said that they had been inundated with dozens of complaints from SUPER-UW students and their allies. The pro-Israel students refused to budge. Said Zvi, “the complaints were just because we are Jews that promote peace and oppose discrimination and hating narratives. “We firmly declined to take down or move our Israel display” said Rozen-Wheeler. “We told the staff from the Student Activities Office that “in America we have a right to free speech”. Added Zvi,”we were not going to be silenced by racists, especially when our message is coexistence, peace, facts, and chocolates.” The Office of Student Activities backed down. Adam Rozen-Wheeler and Jessica Schwartz manning the Israel educational display for CHAI-UW. The CHAI-UW students continued to use their display as a platform for peace education throughout the week. The message of coexistence unfortunately was not absorbed by all. Late Friday morning the Israel education display was vandalized. 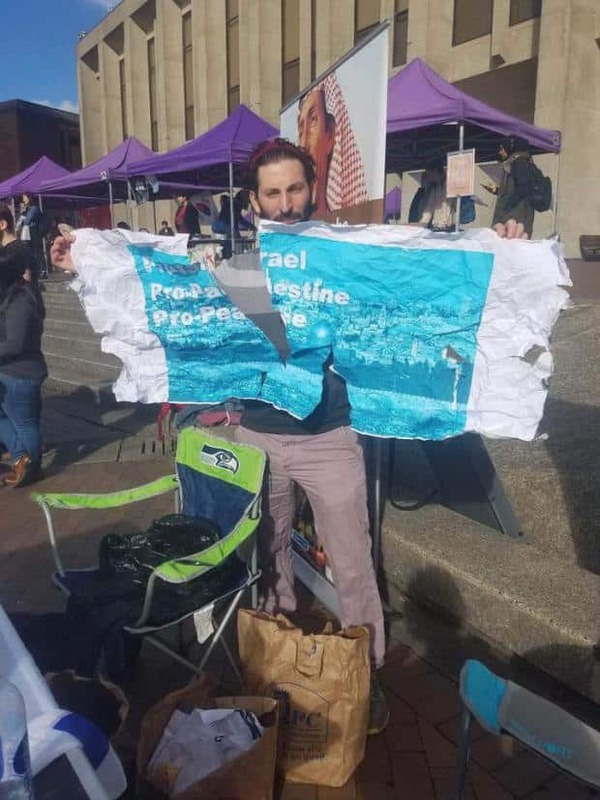 According to UW student Jessica Schwartz who was manning the table at the time, “someone in a green hoodie and black backpack came past us and tore down our Pro-Israel, Pro-Palestine Pro-Peace poster and ran away”. Despite being harrased and their display vandalized “we will never stop standing up for our beliefs” say these Israel advocates at the University of Washington. UW police were called for assistance but according to those present, the police did not arrive until 56 minutes after being summoned. The perpetrator of the attack was by then long gone. According to a study completed by the AMCHA initiative, the University of Washington was among those US colleges with the highest incidents of anti-Semitic and anti-Israel incidents. Throughout the week the anti-Israel student coalition repeatedly spurned efforts at dialogue initiated by the Jewish students. Despite the hostility the CHAI-UW volunteers felt the effort was worthwhile and noted that they had many more positive, rather than negative exchanges. Said Schwartz “We had a chance to meet some more curious minds and hopefully educate them a bit”. The Pro-Israel students were appreciative of the support given them by several individuals, most notably Rob Jacobs and Elizabeth Davis of StandWithUs. TMR reached out to the Jewish Federation of Greater Seattle for a comment, but as of press time they had not yet responded, nor have they issued a press release as of yet condemning the vandalism and harassment of the Jewish students at the UW. Will the harassment and vandalism they experienced this week discourage the CHAI-UW students from teaching the truth about Israel? “We will never stop standing up for our beliefs” said Schwartz.